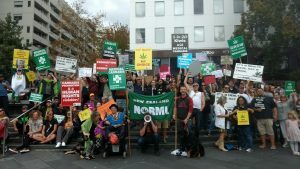 NORML and Auckland Patient’s Group presents their 4th Queen Street RALLY for medical cannabis. SATURDAY 5TH AUGUST 2017, NOON TO 2PM. QUEEN STREET, AUCKLAND – OPP. AOTEA SQUARE – CNR OF WAKEFIELD ST.
Join us, invited guests and speakers, patients, caregivers and supporters all calling for safe legal access to natural affordable cannabis. The Government’s piecemeal changes do not change much for patients, who are still needlessly suffering. Very few patients qualify due to the tough criteria imposed by Ministry of Health officials. Access is extremely difficult, especially for sick people who need to concentrate on getting better, not filling out forms and fundraising for unreasonably priced pharmaceutical alternatives to a herb anyone can grow easily and cheaply at home. We are calling for patients and their caregivers to be allowed to grow and use cannabis for health purposes. We want the NZ Police to declare a moratorium on arresting or prosecuting anyone for medical use/cultivation/supply while this important debate is occurring. We also want pharma cannabis meds to be more available, and affordable. We want approvals for products and patients to be fast tracked. We want more funding to be put into researching medicinal uses of cannabis here in NZ. We want a domestic industry producing the world’s best cannabis meds. We want to support politicians, parties and election candidates who support us, including raising awareness of what is happening (or not) in Parliament. We want you to not suffer and to be able to obtain cannabis for health purposes, should you need it. Join us and show your support. THIS RALLY WILL BE HELD ON THE FIRST SATURDAY IN AUGUST, FOLLOWING ON FROM OUR PREVIOUS RALLY WHICH WAS ON THE FIRST SATURDAY IN JULY. THE NEXT RALLY AFTER THIS WILL BE THE FIRST SATURDAY IN SEPTEMBER.